WEST LAFAYETTE, Ind. — Hoping to broaden understanding about the benefits of Omega-3 fatty acids, a Purdue University-based international consortium has launched a Web site and newsletter campaign to educate the public, physicians and veterinarians. Omega3learning.purdue.edu answers basic questions about what Omega-3 fatty acids do, where to find them and how to ensure a person is getting the right type of Omega-3s. Bruce Watkins, Purdue professor of nutrition and director of the International Omega-3 Learning and Education Consortium for Health and Medicine, said most people know that Omega-3 fatty acids are good for them and can often name a few foods that contain them, but that’s about it. Omega-3 fatty acids are found in nuts, oils and fish. Some are essential for retinal and brain development in infants, for instance, and for reducing the risk of cardiovascular disease in adults. 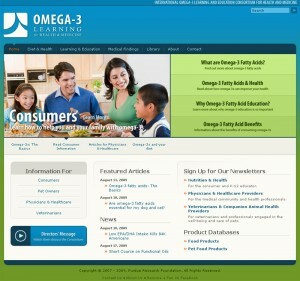 The Web site, http://www.omega3learning.purdue.edu, answers basic questions about what Omega-3 fatty acids do, where to find them and how to ensure a person is getting the right type of Omega-3s. There also is information for doctors and veterinarians, including fact sheets and handouts for their patients. “There’s a lot of fundamental information for the consumers and doctors so they can better serve themselves and their patients,” Watkins said. There also is a database of foods and pet-food products that contain Omega-3s, which includes the amounts and different types of Omega-3s found in each serving of a particular food, along with other dietary information. The site also includes a chart that shows how much and what type of Omega-3s men and women of different ages and with differing health histories should consume. Newsletters for doctors, veterinarians and consumers will go out every other month and can be received by signing up on the site. Watkins said he hopes people will be able to use the information to make healthier choices in their diets. “We want to give them the fundamentals so they can begin to understand on their own,” he said.